Alison Shanks pushed her way into the top echelon of female pursuiters of all time with a record breaking effort at the Oceania Track Cycling Championships in Invercargill tonight. Shanks produced a stunning 3:28.475 effort to claim the title, and shatter the New Zealand residents’ record. Her time was more than a second under her previous best, set in winning her world championship title in Poland in 2009. Coach Craig Palmer said the time would put her into the top six riders of all time. This was followed up with a record performance from teammate Jesse Sergent who also set a new national record clocking 4:16.139 to win the men’s 4000m individual pursuit. It broke his own national record by half a second, beating teammate Peter Latham (4:21.483) in the final. Shanks said she was delighted with the performance which shows she and the team pursuit teammates are on target leading in to next week’s World Cup in Colombia and on to next year’s Olympics. “We are not peaking by any means. This shows we have good early season form and gives us real confidence looking ahead,” shanks said. “I’ve spent more time on the road and more time in the gym in the build-up and it shows we are well on track. Sergent said he was focussed on a top performance in what could be his final individual pursuit, as he moves his focus to the road after the team pursuit campaign to the London Olympics. “I felt quite tired after the morning ride but had a good recovery and a sleep in the afternoon and felt really refreshed,” Sergent said. “I wanted to get that record for sure and I wanted to take advantage with the track running fast. The records also fell in the Under-19 ranks when Waimate’s Dylan Kennett took out the 1000m time trial. Kennett, who set a national record in winning the individual pursuit yesterday, clocked 1:03.644 to claim the kilo time trial, which broke Eddie Dawkins’ 2007 of 1:03.700. Auckland’s Georgina Wilson, eighth at the world championships in Moscow this year, took out the women’s under-19 final, clocking 2:30.257, a new personal best. Outstanding Southland-based sprinter Natasha Hansen made it three from three when she came from the rear of the field to dominate the final of the women’s keirin after winning the team sprint and the 500m time trial. She is looking to recover before chasing a national record in the individual sprint on Thursday. The fans were treated to a star of the future in world junior champion Caleb Ewan from Australia who won the under-19 omnium, winning four of the six events including all three tonight – the individual pursuit, scratch race and time trial. He finished clear of Nelson’s Kristoff Ford. Te Awamutu’s Hayden McCormick rounded out the evening with a brilliant performance, the only rider to lap the field in winning the Under-19 points race over 20kms. Women, Keirin Semifinal 1: Katie Schofield (NZL) 1, Cassandra Kell (AUS) 2, Paige Paterson (NZL) 3. Semifinal 2: Natasha Hansen (NZL) 1, Stephanie Morton (AUS) 2, Vanessa Quin (Auckland) 3. 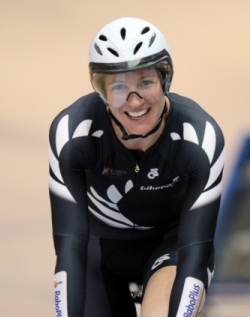 3000m individual pursuit, gold medal: Alison Shanks (NZL) 3:28.475, 1 (NZ Record); Jaime Nielsen (NZL) caught, 2. Bronze medal: Lauren Ellis (NZL) 3:38.920, 3; Rushlee Buchanan (NZL) 3:43.463, 4. Under-19, 2000m individual pursuit Gold medal: Georgina Wilson (NZL) 2:30.257, 1; Alysha Keith (Otago) 2:36.557, 2. Bronze medal: Holly Takos (AUS) 2:35.307, 3; Stacey Riedel (AUS) 2:35.525, 4. Men, 4000m individual pursuit, gold medal: Jesse Sergent (NZL) 4:16.139, 1 (NZ Record); Peter Latham (NZL) 4:21.483, 2. Bronze medal: Sam Bewley (NZL) 3, Edward Bissaker (AUS) 4. Flying lap: Kristoff Ford (NZL) 13.762, 1; Caleb Ewan (AUS) 14.014, 2; Chad Elliston (NZL) 14.148, 3. Points 15km: Jack McCulloch (AUS) 29 points, 1; Thomas Kaesler (AUS) 25, 2; Ewan 16, 3. Elimination: Ewan 1, Reece Robinson (AUS) 2, Elliston 3. 3000m individual pursuit: Ewan 3:25.504, 1; Ford 3:27.273, 2; Josh Harrison (AUS) 3:28.693, 3. Scratch race, 10km: Ewan 1, Ford 2, McCulloch 3. Time trial: Ewan 1:05.259, 1; Ford 1:05.698, 2; Tayla Harrison (NZL) 1:07.173, 3. Overall points: Ewan 9 points, 1; Ford 23, 2; McCulloch 26, 3. 1000m time trial: Dylan Kennett (NZL) 1:03.644, 1 (NZ Record); Tirian McManus (AUS) 1:05.084, 2; Alex Radzikiewicz (AUS) 1:05.749, 3. Points race, 20km: Hayden McCormack (NZL) 1, Dylan Kennett (NZL) 2, Tirian McManus (AUS) 3.